Software applications and IT operations are both becoming more complex. Today’s applications are typically composed of multiple servers, queuing, caching, databases, file storage, NoSQL, third party web services, and more. These new applications are typically more scalable and fault tolerant than traditional applications but they are also more difficult to manage and troubleshoot. Operations and development teams need remote application management tools, including application monitoring and remote server access to research and resolve production application problems quickly. Traditional IT systems management tools are designed to manage and monitor servers. To support today’s applications, operations and development teams need a new generation of tools designed to remotely manage and monitor their applications. An application viewpoint allows operations to understand the entire application stack and overall application health. Many companies don’t know what applications are installed on which servers. Developers and operations both need tools to quickly see the location and health of their applications. Using our web application portal, developers can quickly discover where their applications are installed and rapidly access the information they need to troubleshoot application problems. Developers don’t need to login directly to the servers and no VPN access is required which enables operations to reduce risks and improve security. Stackify automatically pinpoints where your applications are running. It is designed to work with all application types including web apps, background services, and scheduled tasks. Windows and Linux servers are supported as well as physical, virtual and cloud servers. Today’s applications have many moving parts that may span multiple servers, technologies and even data centers. Multiple servers and services must be monitored to understand the overall health of an application. Basic CPU, memory and disk type monitoring cannot guarantee that your application is actually working. To ensure your application is working correctly, you should monitor the application’s dependencies, functionality and performance. We enable you to verify that your servers are up and that your applications are actually functionally performing the way they are supposed to. Stackify is designed to monitor key SQL queries, files, queues, etc. to ensure that your applications are behaving correctly. When an error occurs, we’ll send you an alert so you can resolve the issue quickly. Traditionally, enterprises don’t provide developers with production access due to security concerns, separation of duties, or other reasons. Production problems commonly arise when developers with production access try to fix application errors but inadvertently create infrastructure problems. For all of these reasons, operations teams typically don’t allow developers to have production access. Stackify solves these problems by providing a web based administration tool designed to help developers remotely manage, monitor and troubleshoot their production applications. 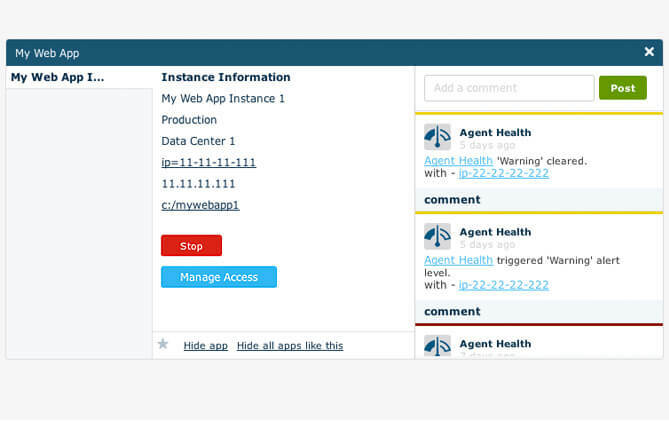 Developers can use Stackify to find where applications are installed, view their health, configure specialized application monitoring, and view the server files and details needed for troubleshooting. Operations can utilize granular security and auditing to limit what developers can see and do. Stackify is designed to solve multiple IT operations problems. Operations can lock down production access while at the same time providing developers the tools they need. With Stackify, you can unite your developers and operations with the next generation service of remote application management. Manage, monitor and troubleshoot your production applications with Stackify.